In March of 2017 we traveled again to Langtang to build some chicken houses in New Langtang. This place has been rebuilt next to the original area of Langtang village which was completely buried in the earthquake of 2015. Our goal was to help find a way to have chickens (and therefore eggs) in the Langtang valley. The Langtangi people don't kill animals in the valley but could really use the protein. Having eggs each day solves this problem. Usually the diet of the people in Langtang consists of rice and dal (lentils). In the past, chickens in Langtang Valley have always been killed by mongoose or frozen in the winter. Fortunately, we found some clients from America that wanted to help with this situation in Nepal. 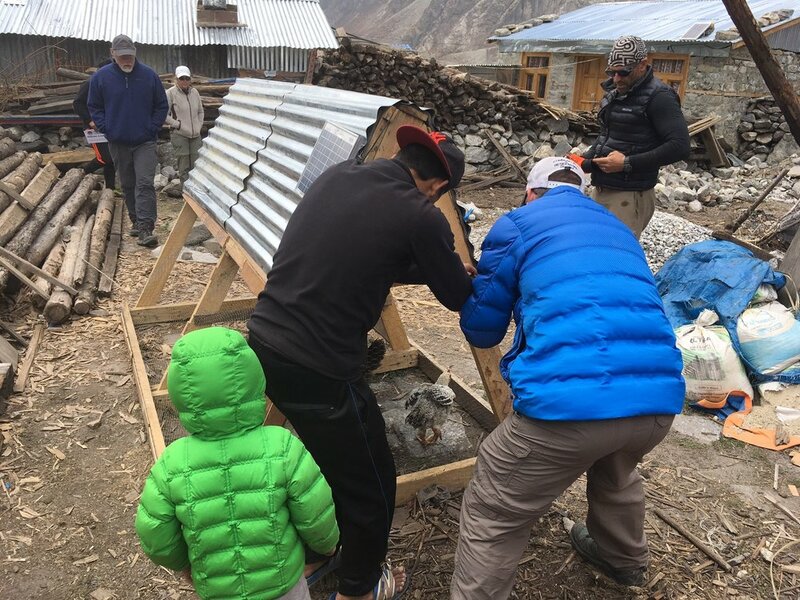 They designed a chicken house that was small, portable, and cheap, but still strong and warm that could be reassembled in Langtang. They built two chicken houses there and brought 8 chickens for the houses. As of today, Dec 6, 2017 only one chicken has died and the eggs that are being produced are enough to feed two families and provide some additional income through selling the leftover eggs. The group of Americans (as well as our staff) also worked for two days to remove rocks from the potato fields of locals who had been injured in the earthquake. After the winter we will be traveling there once again to assess the success of the houses. If it is indeed successful, we will begin to search out partners who want to participate in building more chicken houses in similar areas all over Nepal.